Today is the 1st of Tlacaxipehualiztli; first day of the year 6 Tochtli. As such, for those who have been following this ig account, we also know that today's tonalli is 6 Cozcacuauhtli. Remember, the coefficient for the year (6) will always match that of the first day of the year (6), and years Tochtli start with the day symbol Cozcacuauhtli. All months for this year will begin with the day sign Cozcacuauhtli and end with Cuauhtli (except Nemontemi). With today's equinox sunrise, we marked the last day of the year 5 Calli. Tomorrow's sunrise brings with it the start of the year 6 Tochtli. Whether you've been following this account from its inception or just started, review all the previous posts for the evidence showing how the calendar functions. You can look up more info and purchase calendars at mexikanewyear.com. Don't forget, calendars for the coming year 6 Tochtli will be available for purchase today at this event. We saw in the two previous posts that the first day of the native year fell on March 12th for the year 1519 and also March 12th in 1521 (both Julian dates). As it turns out, both of these Julian dates are the day after the observable Spring equinox. That means that the day of the Spring equinox marks the last day of the native year. If we were to convert these Julian dates to the Gregorian calendar currently used, they would equate to March 22nd. Because of when the Gregorian leap day is added, the observable equinox will now fall on March 20th in some years and March 21st in others. This means that the native calendar will begin on March 21st or 22nd depending on the year in question. To avoid confusion in correlating the two systems, simply remember that the observable Spring equinox will always mark the end of the indigenous year, with the new year starting the day after this celestial marker. In the last post it was already mentioned that August 13th, 1521 is said to have occurred on a tonalli 1 Coatl in a year 3 Calli. Again, we have previously established that years Calli begin with the day sign Ozomahtli, and that there is a correspondence between the coefficient of the year and the tonalli that starts the year in question. As such, the year 3 Calli begins on tonalli 3 Ozomahtli. As in our previous example, to determine when the native year starts, we simply count back through both systems from August 13th (1 Coatl) until we get to the tonalli 3 Ozomahtli. When doing so, we find that 3 Ozomahtli for the year 3 Calli fell on March 12th, 1521. Remember again that this is in the Julian calendar and not the Gregorian used today. As previously stated, in order to establish a correlation between the indigenous calendar and the European, we need to reliably know a date given in both systems. Two dates for which we have said information is (1) the initial entrance into Tenochtitlan by the Spaniards, given by chroniclers as having occurred on November 8th, 1519, with a tonalli of 8 Ehecatl in the year 1 Acatl, and (2) the "fall of Tenochtitlan," given by chroniclers as having occurred on August 13th, 1521, with a tonalli of 1 Coatl in the year 3 Calli. Right now we will focus on the first of these two dates. We have already established in previous posts that years Acatl begin with the day sign Cipactli, and that the coefficient for the year will always match that of the tonalli which starts the year. 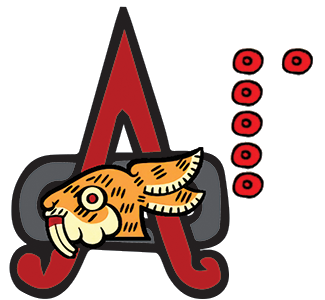 As such, the year 1 Acatl will begin with a tonalli of 1 Cipactli. To determine when the native year starts, if November 8th had a tonalli of 8 Ehecatl, we must trace backwards from here through the European calendar while simultaneously counting backwards through the indigenous system until we arrive at the tonalli 1 Cipactli. Doing so we will find that March 12th in the year 1519 had a tonalli of 1 Cipactli, meaning that March 12th, 1521 was the first day of the year in the native calendar. It should be noted that the European calendar at that time was the Julian calendar, and not the Gregorian used today. Tomorrow at sunrise is the beginning of Nemontemi. In just five more days, we will say goodbye to the current year (5 Calli). Over the next two days, I will post about the correlation between the indigenous and European calendars. For those interested, you can purchase a calendar for the coming year (6 Tochtli) via mexikanewyear.com or in person this Saturday at the San Gabriel Valley Mexica New Year celebration. Today's tonalli is 1 Coatl. Since there are only 260 named days, this means that 1 Coatl (as with any other tonalli) will occur every 260 days. Because there are 365 days in a year (Xihuitl), this also means that 1 Coatl will occur once in some years and twice in others (again, this will also be the case with all other tonaltin), with 1 Coatl falling during different times of the year depending on the year in question. I single out 1 Coatl because it is the tonalli given for the "fall of Tenochtitlan" in the year 3 Calli (August 13th, 1521 Julian calendar). As one of two dates that are recorded in both the indigenous and European calendars, it allows us to establish a correlation between the two systems. With only 30 days left in the year after today, we will spend the next two to three weeks establishing the correlation between both calendars. This account tries to present information gleaned exclusively from pre contact indigenous sources. At times, post contact sources are also used to supplement, but never supplant, the pre contact sources. It is highly recommended that those who are new to this account go back and read all of the posts from the account's inception. Do note that many (if not most) of the posts include multiple images.